First off let me just say this has been a heck of year for me and its kinda a long story on how I found Harlee. 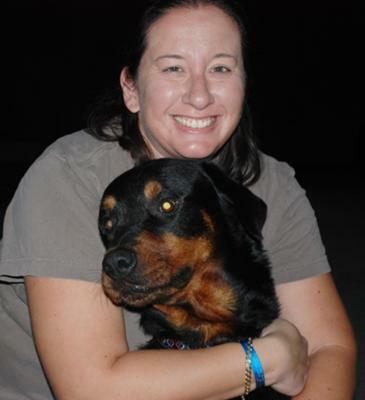 I lost my boy Stanlee, who was an 11 year old Rottweiler/boxer mix in Feb 2011. He had a tumor the size of a volleyball in his belly. I never noticed it because he was such a big boy (110lbs). I was truly devastated by this loss, as I had him since he was 5wks old. He was my loyal and faithful companion, and he was loved by all my friends and family. The day I had to put him down (Valentines day), many were upset that I didn't call them so they could come say good bye. Many tears were shed over this dog and as I type this I have tears in my eyes. . . .But I digress - Sorry. My house was very empty, so I waited a month before going to get a new furbaby. I got Charlee, a mutt of unknown origins. He was 8wks old when I got him and boy he was a handful. It had been 11 yrs since I'd had to deal with puppy hood. I was sure he was going to make me an alcoholic, but the main thing was he kept me busy, active and took my mind off of losing Stanlee. Then about 2 months ago I decided to take Charlee to the dog park that night after being gone from home all day. As we were at the corner to turn into the dog park, Charlee was so excited to go to the park that he jumped out of the car and got hit by oncoming Truck and died in my arms. To say I was a hysterical mess was an understatement. To Lose 2 dogs within a year is something I don't wish on my enemies. I was a mess following Charlee's death, but one thing I did know was that I did NOT want to wait another month to get another dog. I needed something to keep me busy and moving. Also to help me heal. So I went online and started looking at dogs. I always wanted another Rottie or Rottie mix. I love the breed and temperament. I found Harley. I thought it was fate since I named all my other dogs with the lee at the end that I would find Harley (I just changed the spelling of his name on his paper work to fit in). I called the shelter which he was at and the lady on the phone couldn't stop talking about how wonderful of dog he is, so I decided to take a 1.5 hour trip to go see him. I have a smaller older dog that I brought with me to see if they would get a long. He didn't even pay attention to her. He just wanted me to pet him. The shelter didn't have much info on him. They stated he was picked up by animal control with 2 other female Rottie's. He had tags on him and Animal control attempted to contact the owners, but they didn't respond to get him. My take, and the shelters opinion as well was that the previous owners possibly lost their house and let the dogs go. It's obvious that he has had some training, knows his commands and is good on a leash. It just breaks my heart because I'm sure he was wondering what the heck happend to his owners. I personally would rather live in my car than give up my dogs, but that's just me. So, I took him home that day. He is truly a sweet and loving dog. We are working on his high prey drive, as the squirrels and cats on the street are his mortal enemy. Also , small vehicles and golf carts he has a tendency to go after as well. But his issues could always be worse. I hired a dog handler and we are working on his issues, it's just going to take time. You know you see those bumper stickers saying "My dog is better than your honor student?" My dog is better than most people =) Ive been truly blessed to have wonderful dogs in my life. I have never regretted them. Thank you for sharing your story. I wish you many years of happiness with your new fur baby.